April Start, a small town girl born in Pincher Creek, Alberta and raised in Spokane Washington has poured her heart into music her entire life. From backyard concerts at the tender age of six, to most recently opening up for the legendary band, Little Feat at Springfest in Pensacola, Florida, April has drawn from a variety of influences and inspirations. 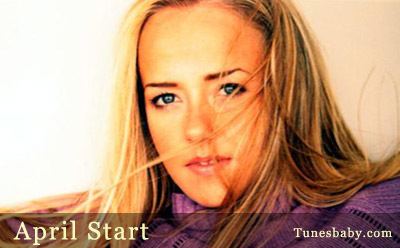 Her music is flavored with hints of pop and a strong country undertone, as well as a well defined Christian backbone. While April finds inspiration in the normal everyday events that comprise day to day living, she also makes a point to stay in tune to the more innate, more spiritual aspect of life, purpose, and future. Among her strongest influences are Shania Twain, Celine Dion, Natalie Grant and Faith Hill. April Start exhibits a determination and a resolution to express herself and her emotions through songwriting and performance, no matter what the cost. Coming from humble beginnings, April spent much of her youth growing up in Spokane, Washington. She was part of a large family with eight siblings, and became well acquainted with the difficulties of making due with the bare necessities. Her early encounters with music include several years studying classical and modern violin, various local performances, and an honored position in the Washington All-State Choir. Fresh out of high school, April began her college career first at a community college, and then later moving on to Washington State University, where she studied music. Certain that music held a distinct place in her future, but uncertain that WSU was the venue for her desire to flourish, April packed her bags in March of 2000 and left for New York City. Focused on her dream, she entered the largest city in the world with little more than pocket change and a deep seated drive to both provide for her family and make her mark in the music industry. April struggled through a string of dead end jobs and meager earnings while consistently working to get her foot into any door that might open for her. She spent her time sending press kits containing her song One Look, the first of many she would come to write and record, to various management and publishing companies. She recorded a three song demo with one interested producer, with hopes of generating major label interest, but after a year of pursuing this avenue, April began to turn her focus elsewhere. Not surprisingly, Aprils warm voice and poignant lyricism quickly caught the ear of another interested producer, and after several months of intense recording sessions, the debut album Changes was born. Changes, was a heartfelt collection of songs which took the listener on a journey from soft, melodic ballads, to profound love songs, to upbeat roll-your-window down pop hits. The new album, according to April, not only encompassed all of the heartbreak and difficulties she had experienced in her life, but also provided a window to display her hope and optimism for the future that lied before her. Still promoting her album, April also kept herself busy making public appearances at such events as Pensacola’s Spring Fest, and assorted small and intimate theaters in New York City. Other significant achievements have included the placement of her songs on various Disney publications such as Zenon Z3, and Eddies Million Dollar Cook-off. Ever the perfectionist, April is currently polishing and reworking her sound, with plans to launch her new material to the public in late 2005/early 2006. She currently is working on writing and recording a collection of new songs which will bear her unique outlook on life as well as her distinct sincerity. All her life, April Start has believed that If you want it, you can get it and that You only get as far as you go. Never one to let difficulty or setback get her down, April is determined to share her sound and songs with the world, no matter what the cost.